If you compare the energy.gov and population maps there appears to be a loose correlation between the population density (high infrastructure?) and BTU’s per person. This linkage may even follow through to Canada which generally has a thin strip of relatively dense population along the border with large sparsely poulated areas to the north. If this is the case then surely the solution you propose is merely peanalising those who live away from the main centres of population. And Tennessee – your graph shows that the big reduction already happening without adding a carrot and stick approach – could this just be advancing technology in action? Yeah, that kind of looks like it’s worth exploring. But what about Texas? 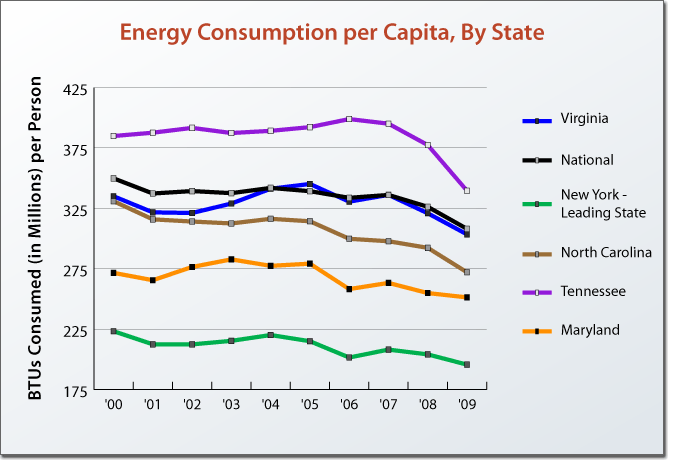 And you’re certainly right about Tennessee making good progress… But, umm, what about Texas? Tom, Are your source numbers sliceable either by county or by industry type? You might find that the densities of detailed population or heavy industry centers were more important. Louisiana looked odd to me, but perhaps that could be accounted for by the amount of petrochemical industry there (or something like that).